There’s nothing more angelic than a sleeping newborn – at least until they start screaming. As a new parent, creating a peaceful environment for your baby is just as important for their good nights sleep as it is for your sanity. If you know you need a quiet place for your baby to sleep but you’re not sure how to build one, you’ve come to the right place. Check out these four easy tips for soundproofing your nursery. You’ve bought the crib and stocked up on stuffed animals, but now you notice how loud it is when your husband rumbles down the hallway, or when your wife is stirring about in the den. All that separates you is that thin door, and you can see his shadow underneath it – a 2″ gap letting in all types of light, and sound. 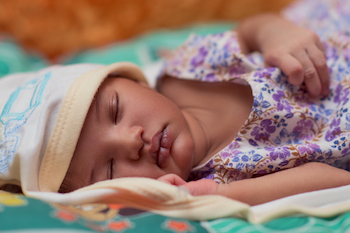 The biggest thing that can awaken a newborn in your nursery is a sudden, loud noise. It’s not the loudness of the sound itself (in decibels), but the immediate change in its loudness. We call this dynamic range – the difference between a loud noise and its preceding silence. To make these sounds less audible, you can add a white noise speaker into the room. These are effective at masking unwanted noise that comes into the room, so that child can continue to dream peacefully. Speaking of that door – why is there so much light pouring under it? If you can slip a piece of paper under the doorway, then it is going to let in a lot of sound! Most bedrooms have hollow-core doors, which let in lots of noise. Solid-core doors are denser and much better at reducing noise. Replacing an entire door may be more work or more money than you’re hoping to put in. If this is the case, check out the Acoustidoor, a customizable sound-blocking panel that hangs over the door frame and cuts out noise. Similar to the Acoustidoor, the AcousticCurtain hangs over windows and blocks out bothersome noises coming from outside the home. 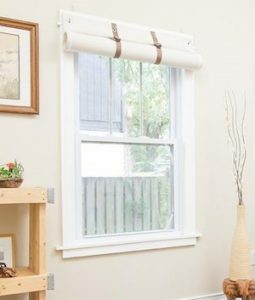 Not only will the curtain reduce noise entering the nursery from outside, but the additional fabric on the walls will help muffle noise inside the room as well. Noise sounds louder hitting bare floors than soft fabric, so you’ll definitely want to invest in carpets. Wall-to-wall carpeting is a great way to muffle noise but can often be a little pricey. You can cut costs and achieve the same effect by laying down decorative throw rugs. Get one big rug that will cover most of the floor or buy a few smaller ones and create a patch-work design. It is most important the carpet is directly above the nursery, so that loud footfall does not penetrate downwards. Follow these sound proofing tips when decorating your nursery and both you and your baby will be sleeping through the night in no time. Explore ways to soundproof a nursery or child's room in your home or apartment by using soundproofing curtains and acoustic door panels. This entry was posted in Acoustics, Living, Soundproofing and tagged acousticpanels, baby, decorating, home solutions, newborn, nursery, Quiet, sound, soundproofcurtains, Soundproofing, tips.